This piano light can be battery or mains operated for a variety of performance locations. Even on dim stages or low light locations this piano light will ensure you son't have to struggle to see what you're playing! 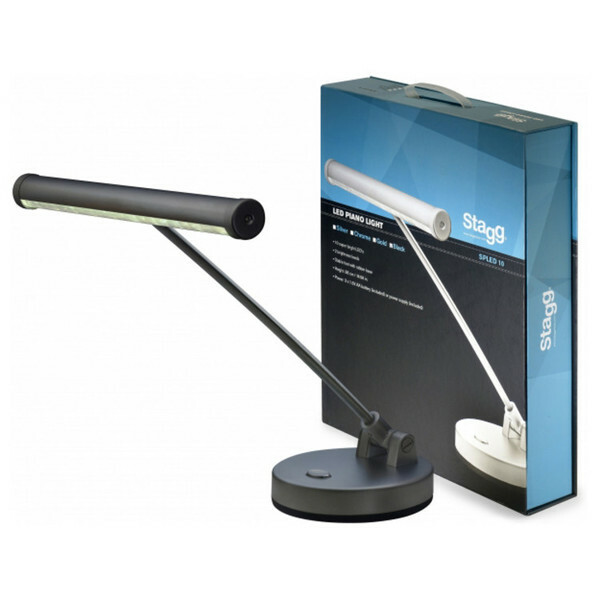 This is a single adjustment, arm, piano lamp with shade from Stagg and includes 10 power LED's. The shade swivel allows you to direct light exactly where its needed whilst an Individual push-switch gives 2-step adjustable brightness. The heavy duty base is rubber padded to protect your piano and create a non-slip surface. This piano light is low consumption using (3x AA/1.5V) batteries or a (5Vdc/ 500mA) power adapter w/ 3 m cable (included).